There are several dental procedures to replace a missing tooth and restore your smile and confidence. 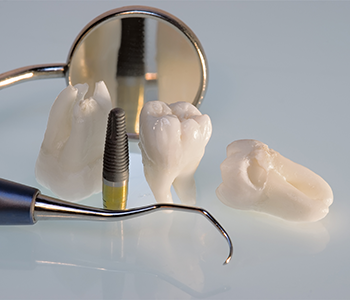 Dental implant treatment is becoming very popular with patients who want a permanent solution and are willing to invest the time and resources into the procedure. Drs. Kevin O’Shea and Pita Dhaliwal of Aberdeen Dental Care in Vernon, BC have helped countless patients improve their smiles with dental implants. Consult with your dentist. During your first appointment, the dentist will examine your mouth, take x-rays and impressions, discuss your options, and answer any questions you may have. Develop your treatment plan. Every mouth is different, and your treatment plan is customised to your desired outcome, budget, and timeline. There will be several factors to consider, including how many teeth need to be replaced and the health of your jawbone. If the damaged tooth is still in the mouth, it will be removed. Your jawbone will be prepared for surgery and the implant will be placed into the bone. After the jawbone has healed, an abutment will be attached to the post and a crown will be placed on the abutment. The process can take three to nine months, depending on the time it takes your mouth to heal after several of the procedures. Patients are kept comfortable during each office visit using anesthesia, or when necessary, sedation. Additionally, because the damaged tooth is removed early in the process, most patients will be fitted for a temporary appliance. Drs. O’Shea and Dhaliwal are committed to ensuring that patients have healthy and happy smiles. For more information, or to schedule an appointment, call (250) 545 3319.